I have posted an image of Stephan’s Quintet in Pegasus, acquired with my Obsession and Mallincam Universe CCD camera. See the bottom image on this page. This is a famous compact galaxy cluster, and is listed as HCG 92 in the Hickson Compact Groups catalog of 100 such groups. The data for the image were acquired in 2014 and 2015, and the result is composed of 983 frames, each of 10 seconds duration. As I have previously noted, I am challenged by an altazimuth mount and no guiding with my dobsonian reflector, and so am limited to very short exposures. Here is a labelled version of the image. As a general statement, Stephan’s Quintet is a group of interacting galaxies. For example, NGC7318A and NGC7318B are clearly performing a cosmic dance. 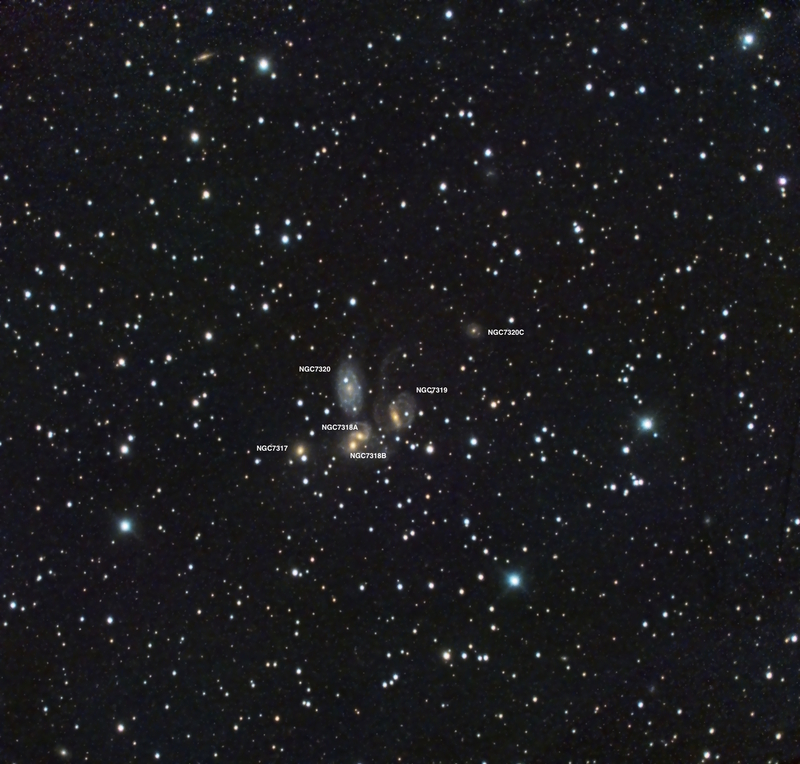 One peculiar aspect of the quintet, however, is that NGC7320 is really not a true participant, as it resides some seven times closer to us than the remaining galaxies and simply happens to be in the line of sight near the true members of the group. (One source gives the distance to NGC7320 as 40 million light years, whereas the other members are roughly 290 million light years away.) But, all is not lost if one wishes for five members in the dance, as there is some evidence that the relatively lonely NGC7320C may in fact be tidally connected to the group. Hmmm. I failed to mention NGC7320C. Perhaps I will follow my own advice and take another look!